The 10U Devils team is an introductory year for the players to the Devils Baseball program. The focus is to provide a strong developmental foundation, coupled with the teaching of some transitional elements, such as leading from a base, stealing, and working from a stretch while pitching. The players compete on a diamond with a 46-foot distance from the mound to home plate, and 65-foot base paths. This is all in preparation for the following year, when they transition to a 50-foot mound-to-home distance, and 70-foot base paths—commonly called an "intermediate diamond." Emphasis during winter months is on mechanics as well as to prepare the player for the spring season. The 11U Devils team is a transition year to the intermediate diamond (50-foot mound-to-home distance, and 70-foot basepaths) for the players. The focus is on providing another strong developmental foundation for the players as with the 10U players, coupled with the continued teaching of transitional elements, such as leading from bases, stealing, and working from a stretch as pitchers. Players compete under open-base rules. 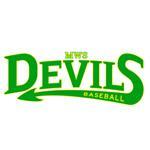 The 12U Devils team is a key transition year to prepare the players for the big diamond at the 13U level. The focus is on providing another year of strong foundational baseball skills and knowledge development as the players compete during their final season on the smaller diamond. As players grow in stature, physical abilities and understanding of the game, they are groomed to transition to the big diamond the following year. The team convenes in the fall to get players on track with their physical conditioning and skills development, and for coaches to gain further insight into the progress and developmental needs of each individual player. As with most other levels in the Devils Baseball program emphasis during the winter months is on mechanics as well as strength and conditioning to prepare the player for the spring season. The 13U Devils team is the transition year to the full-size diamond (60' 6" from the rubber on the mound to the leading edge of home plate, with 90-foot basebaths). The team convenes in the fall to get the players started and for coaches to gain a better understanding of what the developmental needs are for individual players. Emphasis during winter months is placed on mechanics as well as strength and conditioning to prepare the player for the extended spring/summer season and tournament play that includes wood bat and BBCOR (Bat-Ball Coefficient of Restitution) bat restrictions. The 14U Devils team is a continuation year on the big diamond with an emphasis on preparing the player for the next level. With fundamentals in place, the goal at this age group is to not only continue to hone individual skills but to develop the baseball mindset so that players can mature and grow in a team environment with a clearer understanding of the game. The extended season includes multiple competitive tournaments where players can showcase their talents in preparation for their high school careers. The 15U Devils team is comprised predominantly of rising sophomores and Freshman in high school whose desire it is to play college baseball. The 15U summer schedule is focused on playing in the Elite Baseball League 15 Division 1 League and attending well-attended local and regional tournaments that provide maximum college exposure for the players. The 16U Devils team is comprised of a mix of rising sophomores and juniors in high school whose desire it is to play college baseball. The 16U summer schedule is focused regionally tournaments and one national tournament to get players exposure to the collegiate recruiting circuit. The Devils 17U College Prospect team is comprised of predominantly rising juniors in high school whose desire it is to play college baseball and who are looking for a summer schedule in which they will be provided exposure to a number of college coaches through local and regional tournaments, as well as through MWS Devils own recruiting events.